After finally pressing my de jure claim on Briefne and defeating the county, I expected it to be difficult bringing the region in line. In order to keep their now defeated and vassalized leader, Arzhel, happy I tried giving him an honorary title and tossing him a few gold. It worked for a time, but eventually he just said to hell with it, called out Enri as a pretender, and we were back at war. As luck would have it, though, it was a very short war. I marched my troops back into Briefne, and they got down to the business of smacking around enemy soldiers. Moments later I was informed that Arzhel was dead, and that the war was over, so things worked out rather well there. I didn't even need to call in foreign help, which was quite nice. Now the dead count's daughter is next in line to run Briefne, but she came to power a child, so there was a Regency over there after the war. This was great for Connacht, though, because with a young, impressionable mind over there, I'd have plenty of time to get on her good side. 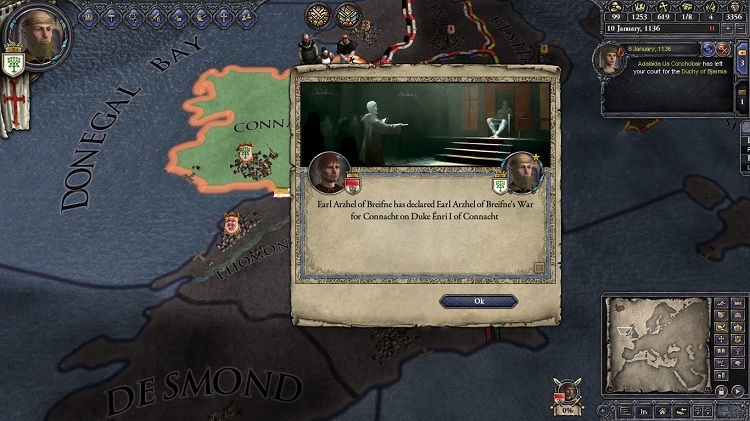 I kept my chancellor over there telling the girl how wonderful Enri and his regime are, there were countless feasts, fairs, and hunts, and I took every opportunity to improve her opinion of the duke. This worked out quite nicely in the end, as she has a decent level of approval of him now that she has reached adulthood. 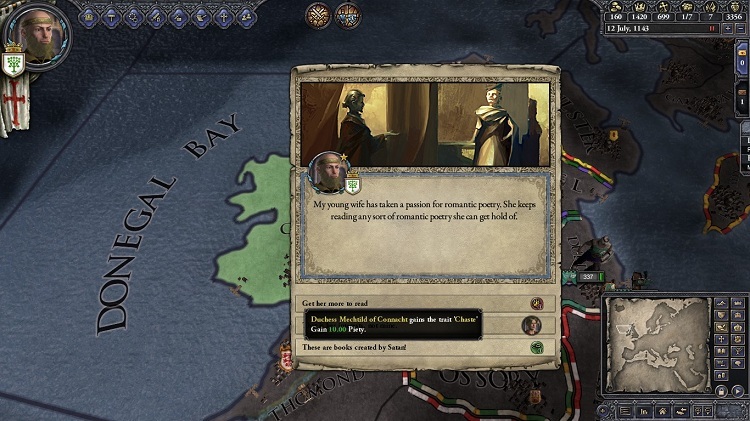 She can even attend Connacht's feasts herself since she's come of age, so there are even more opportunities to butter her up in the future. While idly scanning the map, I also noticed that Scotland has been expanding quite a bit, and has even gained a foothold in Ireland. They seem to be staying put in Ulster right now, and neighboring regions are on guard. It'll be a little while until the Scots are a threat to Connacht, but I'm keeping an eye on them for now. If they try to enter my territory I have a number of alliances at my disposal including Castille, Sweden, Norway, and France. Hopefully the threat of being stomped by some of Europe's greatest powers with give Scotland pause before trying to invade my fair dukedom. Meanwhile, I've also been learning about the different succession laws as well as how titles pass hands. I finally decided to give Enri's brother a landed title since he wouldn't shut up about it, so he became the Baron of Anchory. He seemed happy about that, but a few years later because he'd married a daughter of the French royal family he somehow managed to become the King of Leon. I don't think he let the title go to his head because he stayed on as Enri's religious adviser on the Connacht council. 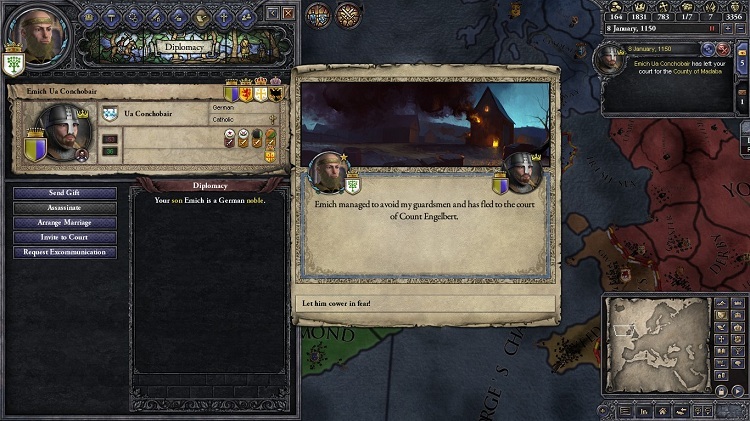 The problem here is that I also wound up changing my succession laws to agnatic-cognatic primogeniture, which gives all titles and lands to a ruler's oldest son upon death. With that it's apparently important to have a landed title to give to your heir, and now I have none to give. It's not the end of the world, and not entirely necessary, but it would have been nice to make him a baron. Live and learn I guess. 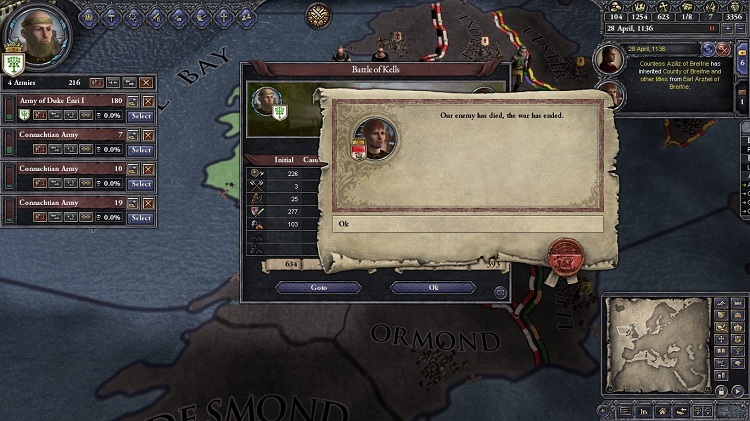 Also, it seems like Enri's heir, Emich, also turned into a complete moron the moment I changed the succession laws. Suddenly he was running around plotting murders left and right. My spymaster discovered these schemes twice before getting bumped off himself by the idiot. It's like he figured he's guaranteed to be duke now, so he can do whatever he wants. After that I'd finally had enough and figured I'd toss the lad in prison for a few years while he takes some time to think about what he's done. Instead he managed to avoid arrest, and buggered off to the Continent. Now he's off fighting in the Crusades. With that I'm left wondering how secure my family line is. If Emich is gone, does that mean there's no one left to take the throne in primogeniture succession? Enri has three other sons, so if Emich doesn't take the throne, I really hope one of them can rule instead. If not, I may be facing game over soon assuming the family line cannot continue to rule under the new laws. Next time I play a session of this game, if I have an heir that starts behaving badly I'll likely just have him executed instead. I have a feeling that may be the better way to go. For now, I'm hoping that Emich dies in the Crusades. It'll certainly make my life a lot easier.